Three times defending champion Khiry Creque fended off a late charge from Tarique Moses as he led an opening day record 254 participants o the line in Saturday opener of 19th annual Highland Spring College Classic Series on Tortola. Creque had a winning time of 11 minutes 59.13 seconds to Moses’ 11:59.74 as the only two runners breaking 12 minutes. Samantha John—the BVI’s 800m National Record holder—opened with a time of 13:23.77 to win the women’s division. Penn said Women’s winner John finished just ahead of 2012 co-champion Tarika Moses who missed last season won by Julain Potgieter who expecting and will miss this year’s series. “It’s wide open what will happen in the women’s division,” Penn said. The race director added that Creque started with a slower time than the 11:25 he did last year so there’s lots of room for improvement if he and others are to threaten the 10:45.3 course record that has stood since 1997. 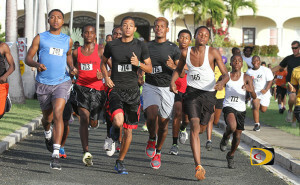 In the Primary Schools Cross Country division, Penn noted that Althea Scatliffe Primary School Team I, is really strong. “I don’t know if they are beatable but we do have some other teams behind them—teams from Cedar School and Francis Lettsome Primary with two teams and Joyce Samuel—we’ll see what happens in the next race,” she said. The next race on Tortola is scheduled for Oct 4. The second race on Virgin Gorda is set for Saturday starting at 7:30 a.m. this race will be run in conjunction with the Virgin Gorda Cancer Society. Organizers are asking children to bring $1 and adults $5 with proceeds going to the Virgin Gorda Cancer Society. Final Results: One Mile (Under 9); Boys: 1. Sam Potgieter, 7 minutes 43.66 seconds. 2. Johari Lacey, 8:10.03 3. Latriel Williams, 8:27.05. 4. Sabastian Esser, 9:14.43. 5. Charlie Potgieter, 9:16.18. 6. Abijhah Christopher, 9:48.19. 7. Josiah Means, 9:54.81. 8. Izaiah Frett, 8:30.63. 9. Apollo Henry, 15:35.59. 10. Xavier Morgan, 16:33.06. 11. William Holmes, 18:42.99. 12. Henry Clifton, 18:59.75. Girls: 1. Asia McMaster, 9:05.05. 2. Katherine Jones, 10:50.24. 3. Amia Wheatley, 10:50.44. 4. Z’hara McLean, 11:06.46. 5. Kenniqua Grate, 11:52.18. 6. Tiya Herbert, 13:11.73. 7. Lorlei Eser, 13:21:87. 8. Zaireah Varlac, 14:41.02. 9. Kabrina Hull, 14:59.30. 10. Coralie Leboyer, 15:40.59. 11. Felisity Means, 16:56.06. 12. Mckenzie Crabbe, 17:33.02. 13. Tiffany Herbert, 18:42.64. Also participating: Jaydenne Daley and Taryn Augustine. Two Mile, Men: 1. Khiry Creque, 11:59.13. 2. Tarique Moses, 11:59.74. 3. Khoy Vanterpool, 12:21.27. 4. James Carr, 13:02.92. 5. Valique Graham, 13:07.99. 6. Chaz Fahie, 13:12.63. 7. K’Cei Moses, 13:24.20. 8. Rackeel Jack, 13:25.67. 9. Samuel Romney, 13:34.56. 10. Richard Morgan, 13:37.35. 11. Simon Cook, 13:40.60. 12. Russell Crumpler, 13:45.27. 13. Joshua Hill, 13:47.77. 14. Jelani Norman, 13:52.95. 15. Derek Rawlins, 14:10.67. 16. Adrian Dale, 14:26.03. 17. Jomo Rochester, 14:30.31. 18. Joseph Graham, 14:30.85. 19. Trent Herbert, 14:35.27. 20. Ray Wearmouth, 14:58.60. 21. Two Mile, Women: 1. Samantha John, 13:23.77. 2. Tarika Moses, 13:26.56. 3. Katrina Crumpler, 14:17.49. 4. Rosmond Johnson, 14:55.03. 5. Kay Reddy, 15:10.87. 6. Clare-Louise Whiley, 15:22.60. 7. L’Tsha Fahie, 15:36.67. 8. Beyonce DeFreitas, 15:37.63. 9. Akada Charles, 15:48.45. 10. Arianna Hayde, 15:59.13. 11. Natasha Ruscheinski, 16:11.60. 12. Debrorah Smith, 16:24.67. 13. Anique Daniel, 16:59.56. 14. Darwn Peters, 17:11.87. 15. Debbie Bell, 17:27.27. 16. Philomena Robertson, 17:28.63. 17. Sh’Kaida Lavacia, 17:34.77. 18. Zakharia Frett, 17:36. 03. 19. Candy Wilks, 17:42.85. 20. Ghislaine Hoogendijk, 18:32.03.